Throughout route the asphalt covering is 6 km of the road, the improved dirt road-19km and a dirt road – 11km. A relief is equal. In wood during dry weather difficulties can create dirt roads as their cloth it is similar to beach sand. Having dried up it can get stuck in a bicycle wheel, having complicated movement. Rain can create problems only on absolutely short sites of road. Moving on Davgavpils-Rezekne highway, it is necessary to be careful of heavy traffic, especially, if you have planned a trip with children. Any healthy person can overcome the route for one day, and children senior than 10 years. Purchases need to be planned in Jaunaglone, but here it is possible to purchase only products and essential commodities. If you need to repair bicycle then necessary details can be got only in Aglone. At good weather and desire to have a swim the best swimming places are on both coasts of peninsula of Ubeli gulf and near the guest house „Silmalas”. You can spend night in the guest house „Silmalas” in Siverenie, in rest house „Jāņi” in Sekstos, in the rural house „Pagalmiņi” in Lielas Bernanos, in rural house „Trepes” and in hotel of Jaunaglona high school in Jaunaglone. All these places, except for hotel of Jaunaglona high school, give possibility to spend the night in tents. Rušons is the eighth biggest lake in Latvia and with its many creeks and island is one of the most picturesque lakes in Latvia. Its area is 2373.0 ha, together with the islands 2407.0 ha. Maximum length reaches 13 km, but the width – 5.5 km. The average depth is 2.9 m, but the maximum depth reaches 29.9 m and this place is at the end of the creek Ūbeļu līcis. The lake has complicated configuration and long coastline. The west part makes broader aquatorium, there are 10 conservation islands. In all there are 34 islands in the Rušons. Eastward the Rušons gets narrower and gets to the meandering creek Ūbeļu līcis where there are many scenic creeks and islands. From the main part of Rušons it is separated by a big wooded peninsula so this long creek sometimes is called also the lake Ūbeļu ezers. As it is testified by the archaeological objects, finds and written historical sources, the surroundings of the lake Rušons has been populated very long ago and heavily. Some of these objects in the cycle route we shall get to know also in presence. 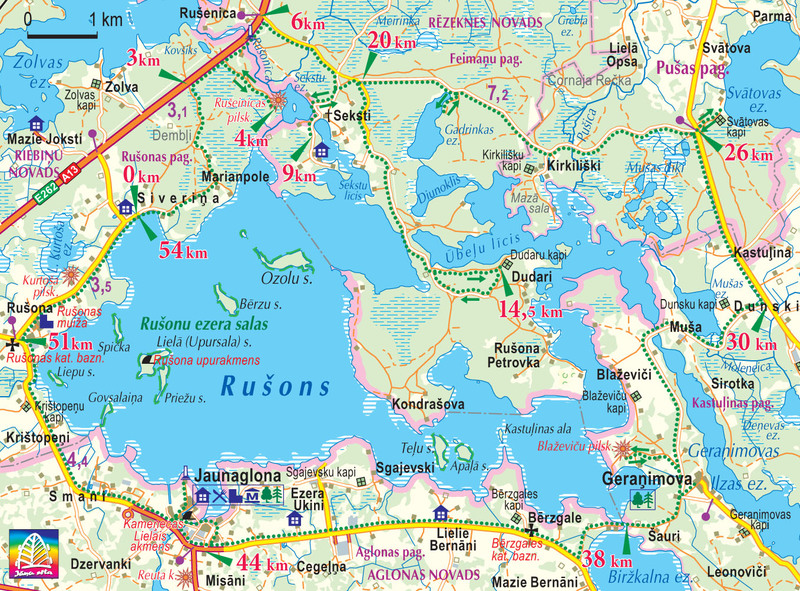 It is convenient to begin the route from the guest house „Silmalas” that is located in the Siveriņa, north-west part of Rušons, ca. 1 km from motorway Daugavpils-Rēzekne. By agreement with the owners you can leave the car here and if necessary also stay overnight. We begin the tour north-eastwards on the mud road along the lake creek. The road goes through a wood. We pass two houses. At the second house we turn right and go till we see the third house. Here is a T-form cross. We have gone 1,5 km and at this cross we turn left and continue the route on a wood road to the motorway Daugavpils-Rēzekne. We choose the better beaten roads – it ensures getting on the mention motorway. When gone another 1,5 km we are on the motorway. We continue the route on the right and after 0,5 km we turn again right in the wood and continue the route on a wood road. In about another 0,5 km we arrive at wooden steps leading uphill. Here we leave our bicycles and go to see the Rušonīca (Rušenīca) castle mound. From the steps we get in an expressive bank and along the crest of the bank we go southwards in the direction of castle mound. The bank is narrow with sheer slopes. Sheerer they are on the side of river Rušonīca that now and then can be noticed through the trees. After ca. 0,5 km we arrive at Rušonīca (Rušenīca) castle mound. Several banks and moats that we have to cross testify thereof. Dimensions of castle mount plateau reach the length of 90 m and width of 60 m. Triple entrenchment and banks are around it, except for north-east side. These intrechements together with castle mound plateau occupy ca. 200 m long and 100 m wide plot. Most of all our ancestors have lent a hand on the north-west side of the castle mound where the castle mound has merged with the already mentioned bank. Perhaps the attackers had to overcome here 3 moats and banks. All three moats and banks after that bend round the south of the castle mound plateau here and there flattening, and then again forming 4 m sheer hillsides. Banks and moats end at the east side on the sheer coat of the river Rušonīca. At this place the coast of river reaches the height of 16 m. South side of the castle mound very flatly immerses in a marshy wood. Two entries go through the fortification lines, one from north-west and the other from south side. These entrances are well preserved and for experts are easy to notice. Quite recently here were archaeological excavations, the pits left from excavations testify thereof. VAS „Latvijas valsts meži” have put in order the castle mound and its surroundings – they have cut down the spare overgrowing, installed the steps to the lake Seksti and built a shed at the foot of the castle mound. The first person who explored and measured the Rušonīca (Rušenīca) castle mound was Ernests Brastiņš on 29 and 30 July 1925. In 1928 the author published his description and measurements in the paper „Latvijas pilskalni: Latgale”. In olden times the obelisk was built on the aide of motorway, but after the new bridge and road was built you can go by the obelisk by not even noticing it. Sadly, but no one has taken care also about the reference marks. We have gone circa 6 km from the beginning of the route. After seeing the obelisk we go 300 m forwards the motorway and on the first cross we turn right and continue the route on a good gravel road. 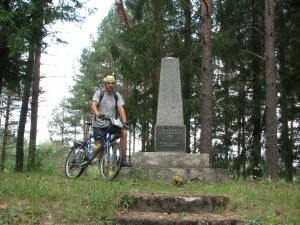 After 1,4 km we get in a crossroads where there is a reference to holiday house “Jāņi”. This road leads to dead end but it is worth going because after 1,2 km you can enjoy landscapes that greet on the lake Seksti and Seksti creek of the lake Rušons. Over the lake Seksti on the north side in a wood you can notice the outline of Rušonīca (Rušenīca) castle mound. We return to the gravel road and continue the route till the next crossroads. On the crossroads we turn right. This road goes to peninsula that is enclosed by Ūbeļu creek of the lake Rušons from the one side and by the waters of the Rušons itself from the other side. This is one of the most beautiful spans of the route. Peninsula is covered by beautiful pinewood although in separate places it is quite deforested. In reck of peninsula the road leads closely along the lake Rušons and Ūbeļu creek. A small resting-place is established on the coast of lake Rušons. Here you can conveniently swim because the lake bed is covered with white sand and it becomes deeper very gradually. When arriving at Ūbeļu creek nice sights greet on the many creeks enclosed by woods. In soviet times this peninsula was very esteemed by inhabitants of former Leningrad who arrived here in their cars and lived here in tents for weeks. Historically this peninsula is populated by old-believers. Of course, as in whole Latgale here also the number of inhabitants has decreased and there are many abandoned houses. When turning on the road that leads along the south coast of Ūbeļu creek, on the head of the hill we arrive at Duduri cemetery. Here you can see the cemetery culture and traditions of the old-believers. Further through the wood we make a bow on the interior of the peninsula and return on the known road from that we return at the crossroads and we continue the route on the right. Totally in the route we have covered 20 km (19,6 km). The road is good with restored gravel surfacing so routing doesn’t present any difficulties. After 1,4 km the road crosses a ditch or a small river. The river disgorges into the lake Gadrinka that can be seen on the right side through the shrubs. To reach better the lake we have to go a little bit further and turn right, go onto a small hill and then again on the right till we get to the place where you can get to the lake. As the lake Gadrinka is located in the middle of the wood its water is very clean; the white waterlilies testify thereof that blow here in bulk. 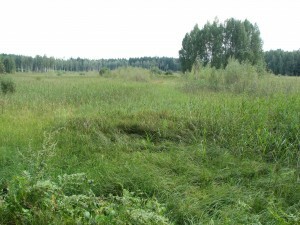 The average depth of the lake is only 1 m, but the maximum depth 1,7 m. The lake Gadrinka is connected with Diunokli that actually is a creek of Ūbeļu creek that is separated from the Ūbeļa creek with a 200 m long reck. Having enjoyed the lake Gadrinka we return on the motorway and continue the route. This is a deserted and lonely span so frequently there are cases when forest animals cross the road. After 1,6 km on the right we can see buildings and a pond overgrown with reed pa, these are Kirkiliškas. We have entered the Pušas parish. After another 0,4 km we cross the nullah Pušicas. The road continues through a wood and after 1,1 km we arrive at Mušas ponds. The water in ponds is passed and they are overgrown with reed and in places it begins to overgrow also with shrubs. After another 0,9 km we arrive at Malta-Priežmale road. Totally from the beginning of the route we have covered 26 km (25,83 km). We cross the abovementioned road and go to see the lake Svātova. The lake Svātova is the second biggest lake in the Pušas parish. Its area reaches 133 ha, maximum depth – 6,1 m. We have to go 500 m from the motorway to the lake. The banks of the lake are gently sloping and low, the bed is smooth and muddy. Having seen the lake we return on the motorway and continue the route in Priežmale or south direction. The road is still enclosed by wood, but after 2 km the wood ends and we get in a glade. Not only we have left the Puša parish, but also the Rēzekne county and we have entered Aglona county Kastuļina parish. After another 0,7 km there is a road on the right that we have to take. We have covered 30 km. We continue the route and after 0,7 km a beautiful scene greets on the lake Mušas. Having gone round the south end of the lake Mušas we arrive at a bridge. The nullah we cross connects lake Geraņimovas Ilzas with the lake Rušons. When going away the road on the left after some metres we can get at the north end of the lake Geraņimovas Ilzas that in summers is badly overgrown with waterweeds. Behind the nullah the road turns sharply on the left and goes parallel to the lake Geraņimovas Ilzas. From the lake it is difficult to see something because the lake is in a deep bed. 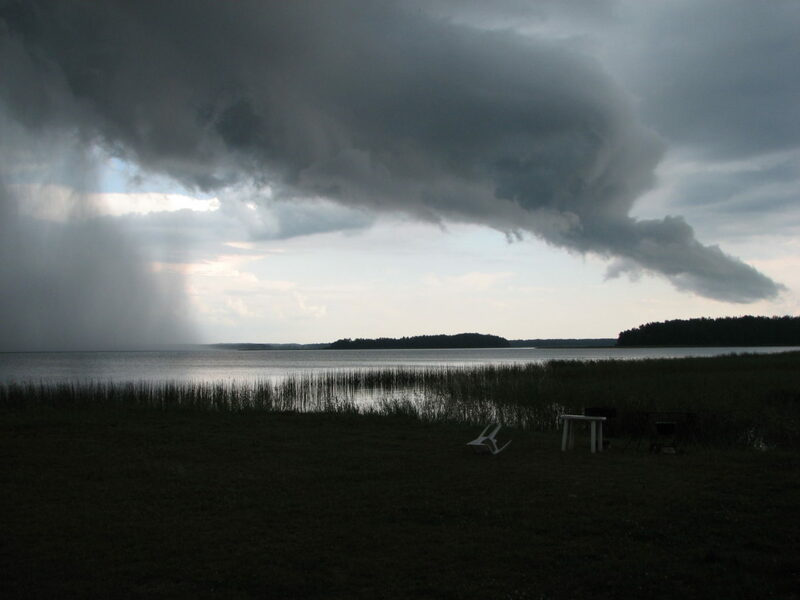 The lake Geraņimovas Ilzas is the fifth deepest lake in Latvia. The maximum depth reaches 43 metres. From the bridge we have gone circa 2,2 km, on the right there is a farm track that we take and go to Blaževiči castle mound. We have to go circa 0,8 km till the castle mound. Here is how Ernests Brastiņš describes the castle mound in his book „Latvijas pilskalni: Latgale” published in 1928. The text is kept in the original style: „1 km on the south of Blaževiči parish where the peninsula furthest juts in a quadrangle against the west, there is a 12 m high small hill that is called „Gorodoku” and it belongs to the mentioned Blaževiči parish (Kapiņi parish, Daugavpils county). This castle mound has even plateau, in a longish round form it is 65 m long, 40 m wide. The sides are the highest and steepest on the west side that is directed to the lake Rušons. Eastern sides from nature have been flat and therefore they erst were protected with terraces or ribs. Now this earthwork is already ploughed because on the plateau there is a cornfield. Solely the ends of terraces have remained on the north-east side of the hill. The entrance isn’t definable anymore, but it could have been only on the flat east side. The north end of the plateau that is left fallow has got covered with scrubs. The sheer west side is free from trees and its steepness looks impressively. The south side of the plateau ploughed up and thus black occupation layer with beaten stones and different chippings is dredged up. Chippings are thick and thin, turned and pasted, decorated and undecorated. It is obvious that this castle mound had been populated for a longer period. It was written by Ernests Brastiņš. Everyone will be able to verify how the surroundings of the Blaževiči castle mound looks now by turning in here and seeing. 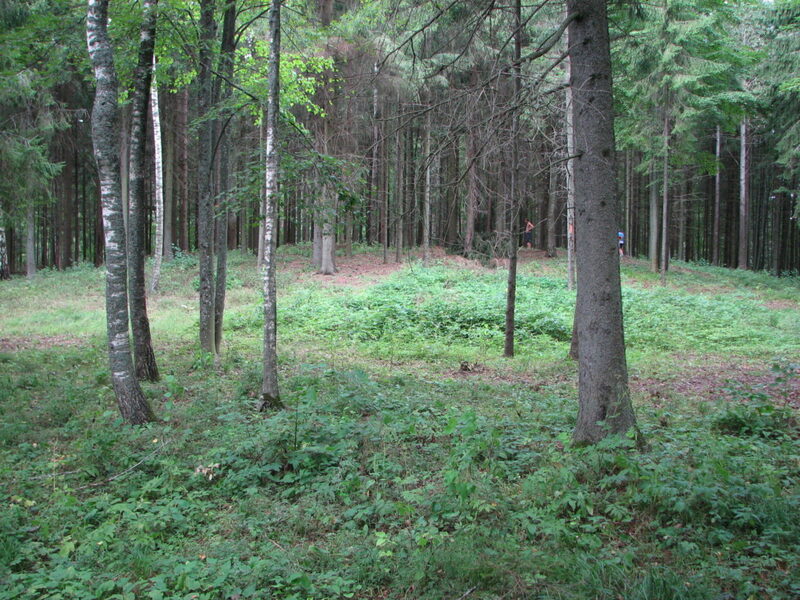 After seeing the castle mound we return on the road and go in the direction of Geraņimova that is reached after 0,8 km. 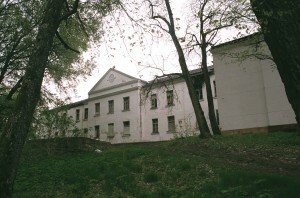 Till First World War Geraņimova estate was an outstanding castle of Empire style that during the Soviet times was rebuilt into a psycho-neurological hospital. Nowadays it is managed by the social care centre „Krastiņi”. Geraņimova Estate Park with linden path has also remained. On the crossroads where three roads branch we have to go straight – on the less used. Having gone ca. 1 km on this road we arrive at the reck separating the lake Rušons from the lake Biržkalns (Kapiņi, Bērzgale). Totally in the route we have covered 38 km (37,7 км). We cross a bridge over the reck and along a farm track past the houses we go further till we reach the motorway. Till the motorway Jaunaglona-Kapiņi we have to go ca. 1 km. In rainy weather this span could be sloppy but easy passable on a bike. On the motorway we turn right and continue the way till Bērzgale Catholic Church that can be seen well from the road. Bērzgale Catholic Church is one of the most beautiful wooden churches in Latvia and one of the most interesting wooden architectural monuments in Latgale. It is the oldest in whole Aglona county. Construction of the church was proposed and supervised by Stefans Mickevičs, the parish dean of that time. The foundation of the church was laid in 1744, construction was finished in 1750 and consecrated in 1751 by the Livonian bishop Jozefs Domings de Kozeļskis-Puzika as God’s solicitude and St. Stephan and St. Laurence custody church. Money for construction of the church was given by Sokolovski, the landlords of Rēzekne county, and by Heronims Oskerko, Vilnius prelate, who owned the Eisbahova estate. The church was built by the peasants. It is built from lumber that are planked. 32 art monuments can be exhibited in the church. Altar and organ prospectus of 18th century have preserved. In the yard you can see the standing apart bell-tower that was built in the 19th century. After seeing the church we continue the route in direction of Jaunaglona. After 4,7 km we arrive at Jaunaglona. Till 1927 Jaunaglona was called Kameņeca. Here is the ensemble of former Kameņeca estate – dwelling house, chapel, and stables with surrounding stone wall. All this is the architectural monument of 18th century. Estate castle was built in 1875 in neo-Gothic style. It was inhabited by Felherzami, then Pavloviči and Reuti families. Originally the castle was built as a three-story building, later in Reuts period it was rebuilt. 7 m high tower was built on the side of the building, workers were observed from there. The estate is enclosed by 7,5 ha wide park with plantation of foreign trees and shrubs. In 1929 a nunnery and gymnasium was established here, in 1940 mechanization school. After recovery of independence Aglona catholic parish retrieved it in its possession that also manages the castle. Kameņeca HPP is located in the westward direction from the estate castle. Originally in 1833 a mill was built on the Tartaka nullih, but in 1930 Aloizs Broks begun the construction of a power plant because it was necessary to light the buildings of nunnery and gymnasium. In 1947 in the result of heavy rainstorm the water level rose strongly and the dam was destroyed because all facilities were wooden and worn-out. The renewed HPP was unveiled on 5 November 1948 that was built in 34 days. HPP gave power to neighbourhood of Aglona and Jaunaglona to 1960. In 1960 HPP was dismantled because Ciriša HPP was built. “With permission of the holiness (meant Pope) Clemens XIII in 1766. And on this Peter rock a chapel was built by the example of Roman Catholic faith of our land and that stone gave the name Kameņeca („Kamieniec”)”. This inscription indicates that on the stone or near it there have been a catholic chapel – preaching house. In the beginning of our century the written stories testify that really there was a church on the stone where several tens of people could go in. Perhaps the chapel wasn’t built exactly on the stone and it was inside the chapel. In other stories it is said that the lightning has split the stone in two parts and the chapel crashed. 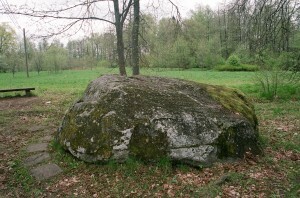 However, the Kameņeca Great stone has also the characteristics of cult stone –a regular cylindrical cavity is carved in the highest place of it (diameter 30 cm, depth 30 cm). It is supposed that originally the stone really had been a component of pagan sanctuary. 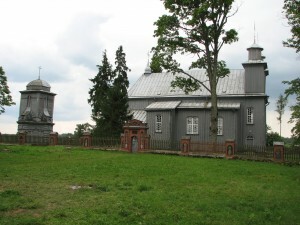 By introducing the Christianity that became active in Latgale in the 17th century due to Jesuit activities a chapel was established in the place of the old sanctuary. Behind the Jaunaglonas HPP on the peninsula on the margin of the lake Rušons there is the so called gallows corner. 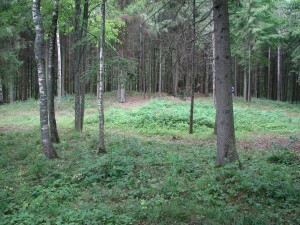 In the spring 1905 peasants from 16 villages of Jasmuižas and Kapiņi parish participated in devastation of estates and cutting of landlords’ woods in Aglona surroundings. Worried by the landlords reports and frightened Vitebsk governor with seven companies of soldiers arrived in Daugvapils county to suppress rebellion. Any turn against the landlords was severely suppressed. Till 1930 a big pine-tree, the so called “Gallows pine” grew on the Gallows corner on that the disobedient peasant of Kameņeca and also of other estates, and also rebels from Poland were hung. Later the pine-tree was sawn and the local people regarded it as a monument that reminded of arbitrariness of landlords. Not far from the place of former Gallows pine in 1978 a memorial stone was placed with an inscription „Punishment place of revolutionists of 1905”. You will have to go ca. 2.5 km through the village to get to know Jaunaglona and its historical places. Having finished the sightseeing we return on the motorway and on the right we go in the direction of Rušona. Soon the white tower of Rušona church is to be seen ahead in the distance, on the right you can enjoy the landscapes of the lake Rušons. We pass the Kristapiņi cemetery and after a while we arrive at Rušona church. From Jaunaglona we have made 4 km. As it is testified by the archaeological monuments and finds and the written historical sources, Rušona (Vecrušona) was the centre of Rušona county. It is the place where we are right now. In 1456 Rušona estate was mentioned that has belonged to Johannes Rebinder. Rušona county included also Aglona with the neighbourhood. Name of Aglona appear in historical sources only in the 18th century. The first Rušona wooden church, one of the oldest in Latvia was built in the 16th century. In 1677 Jesuits with the support of the landlords Sokolovski-Korabi build a new wooden church in place of the old one. In 1766 the Rušona landlady built a new wooden church and a cloister instead of it, but in 1816 the present Rušona stone church with cloister complex was built with the resources of Ieva Selicka. 4 art monuments are situated in the church but in the cellars thereof the monks were buried. Rušona county in old times has been not only a remarkable Latgallian administrative and economic, but also intellectual centre. Here are many places that are called sanctuaries, cult or sacrificial places. From here in Rušons you can see the Great (Upursala) island with its sacrificial stone. The closest to the margin is the island Liepu sala where there is the archaeological monument – settlement. Nearby there is Kurtoša castle mound. All this testifies of the ancient growth of this place. In the historical literature it is written that Rušona through that the international trade route went as a populated place grew so big that it even had hamlet rights. On the right side between the road and Rušons we can see considerable improvement and restoration works. The private owner renovates the Rušona (Vecrušona) estate building and the surroundings. 218 m long linden path connects Rušona Catholic Church with the Rušona estate that has suffered during storms. Rušona estate castle was built in 1903. It is one-storied stone building with two-story central part. Rušona estate castle was built in neo-Renaissance architecture style and it is enclosed by a beautiful park that over the years has become quite squalid. Hopefully the new owners shall put in order also the park. 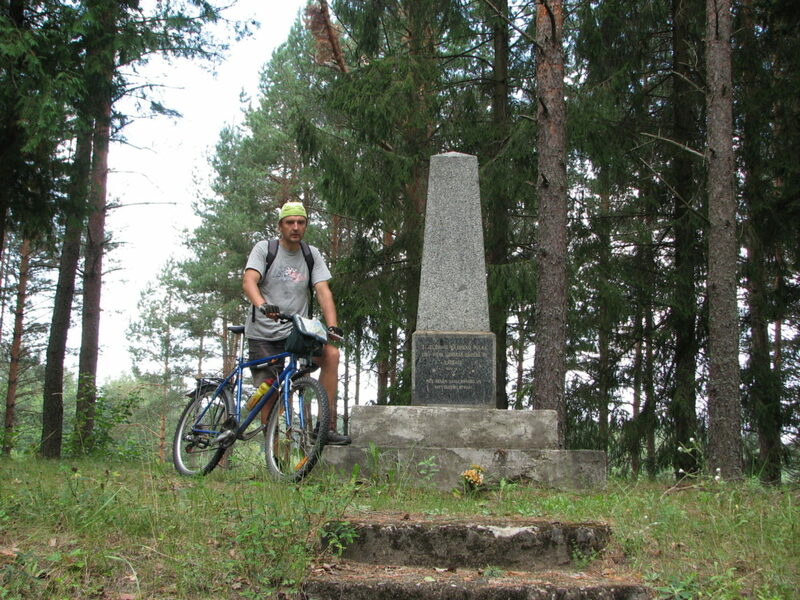 So to the Rušona church in the route we have covered 51 km. At the church we turn right and straight continue the route. After ca. 1,3 km on the left side we can see houses. Behind these houses you can notice the lake Lielais Kurtošs. Here is also the Kurtoša castle mound. Since early days the castle mound is being treated so partially it has lost its heritage value. Also visually it is difficult to distinguish it from the joint scene. This is the last sightseeing object in our route and after another 1,2 km we have returned in the starting point of our route that this time is also the finish line. Totally we have covered ca. 54 km.